There&apos;s no doubt that Hendricks County offers a ton of fun activities for people, but did you know that Hendricks County is a popular destination for dogs, too? Just in the past few months Hendricks County has hosted the Bow Wow Bash at Williams Park in Brownsburg and a Puppy Pool Party at Splash Island in Plainfield. Next weekend, dogs can help navigate their owners through a corn maze at Beasley&apos;s Orchard&apos;s Dog Daze at the Maze event Oct. 24 and 25 noon-4 p.m.
With my beagle/lab&apos;s sense of direction, I&apos;ll bet we could conquer the 8-acre maze in no time! 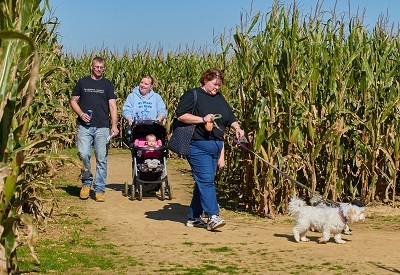 In addition to the maze, dogs and their owners can participate in a variety of other fun activities, including a pet costume contest. Kids can get their faces painted or go on a hayride, and there will also be a variety of food and other vendors. The event also will include local rescue groups introducing dogs to potential new owners. Beasley&apos;s will also donate 50 percent of the proceeds from the maze event to these local rescue groups. So round up your family and head out to Beasley&apos;s Orchard. Not only will you and your dog love your maze adventure, but you&apos;ll also help more dogs find loving, forever homes like yours.